One Snake, Two Snake, Red Snake……..
A harmless juvenile Siphlophis compressus rests on a bromeliad leaf in Amazonian Ecuador. For most people the mention of a red snake evokes feelings of danger. Hmmm, after writing this sentence I realized that the mere mention of snake, of any color, evokes fear and danger. So for the purposes of this entry bare with me and accept that red snakes are scarier (in a biological sense) than the others. Even laypeople recognize the simplified biological concept of aposematism: brightly colored animals, especially those in reds and yellows, tend to be dangerous. This danger can be offensive or defensive. Brightly colored animals can be distasteful, toxic, venomous, or poisonous. I say tend because another biological concept, mimicry, follows suit. Mimicry comes in two main flavors: Batesian and Müllerian. Müllerian mimicry is where multiple species share similarities in appearance and all possess degrees of offensive or defensive characters. In essence the various species pool their resources to confuse predators and gain a defensive advantage. Batesian mimicry is where you have a toxic model species and one or more harmless mimics that try to gain an advantage by passing themselves off as the dangerous model. It is my opinion that aposematism and mimicry are somewhat simplified concepts to explain but biological systems are rarely simple. The bright colors warn predators while the red-touch-yellow warn humans in this classically patterned Central American coral snake, Micrurus nigrocinctus. Coral snakes are often cited as classic aposematic organisms; after all they are brightly colored and dangerous. 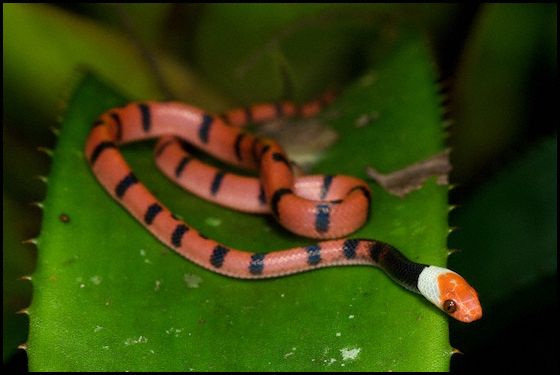 Coral snakes fall within the taxonomic clade of elapids. That is they are the western hemisphere’s version of cobras. And milksnakes and kingsnakes are often cited as Batesian mimics of coral snakes. Milksnakes are colubrids, sometimes mildly toxic, but more prone towards constriction and biting to subdue their prey. People are even aware of the concepts of aposematism and mimicry without even knowing it. I am constantly quizzed on the saying “red touch yellow kill a fellow, red touch black venom lack” or versions thereof. This is fine if you are dealing with one of the 3 limited distribution coral snakes in the United States and its Lampropeltis cogeners. For example compare the pattern of the eastern coral snake Micrurus fulvius, yellow-red-yellow-black-yellow, to that of the scarlet kingsnake Lampropeltis triangulum elapsoides, yellow-black-red-black-yellow. 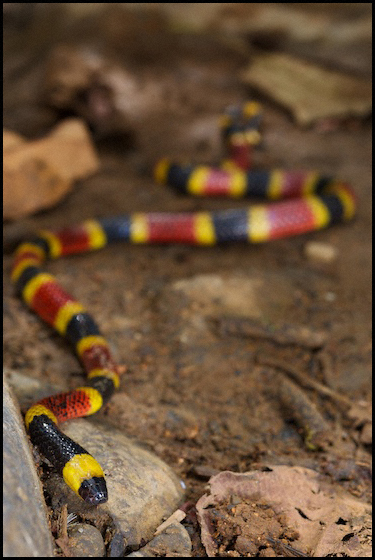 In the coral snake the red bands are bordered by yellow while the in the kingsnake the red bands are bordered by black. I’ll wait here while you do your Google searches since I’ve never herped this region of the US and don’t have my own photos to compare. Back? Ok, lets continue. Erythrolamprus mimus is a mildly toxic rear-fanged colubrid that, like the coral snakes it mimics, feeds on other snakes. This animal was found in the same Caribbean foothill forests of Costa Rica as the coral snake above. I have a question – I know that birds tend to breed with their own kind but are sometimes confused when in contact with another bird of unlike kind but similar in color, etc. and breed with them; although rare. Do snakes make the same “mistakes”? Just curious, what is the type of mimicry you allude to but don’t go into? I’d like to read about it…. 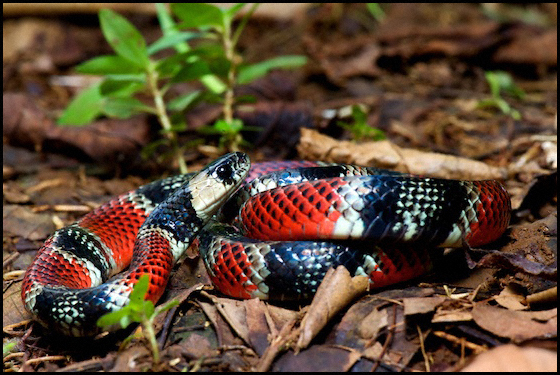 Charlie, many publications on vertebrate mimicy use the coral snake models and most use the relationship between Lampropeltis elapsoides and Micrurus fulvius. That fits a simple Batesian model (if you excluse all sorts of other ecological factors). But when you look at totality of predator/prey/species diversity overlap factors things get murky. Another model, Mertensian, was suggested in the 60’s(?) to describe more of a hybrid Batesian/Mullerian model. This model described deadly Micrurus, fairly toxic Erythrolamprus, and non-toxic Lampropeltis relationships. Greene and McDiarmid suggested this be abandoned in a 1981 paper and suggested that corals and the various mimics throughout Central and South America are Batesian systems. I’m still not convinced it’s that simple and have problems with most of the studies. Do a lit search for coral snake mimicry and you will find a number of papers. I grabbed a handful of PDFs in a matter of minutes working this piece.